A video posted to YouTube on Saturday shows a variant of the Samsung Galaxy S5 in action. The screen is said to be sharper and clearer than the 1080 x 1920 resolution screen on the Samsung Galaxy S5, hinting at a 1440 x 2560 QHD display. According to the source of the video, this could be a pre-production version of the Samsung Galaxy S5 Prime or Samsung Galaxy S5 Active. However, the latter is supposed to come to market with the same 1080p screen found on the Galaxy S5. A thick seal around the side of the phone, which makes it thicker than the regular version, could be a hint that the phone on the video is the Galaxy S5 Active. While the regular version of the phone has IP67 certification, the Galaxy S5 Active is rumored to have IP68 certification which means that it can be submerged in up to 5 feet of water for as long as 60 minutes. Perhaps a tighter seal is required to hit that level of water proofing. The back cover is aluminum, and the phone came "out of the wrapper" with the Google Now launcher. Check out this mystery by clicking on the video below. UPDATE: A follow-up video from the same source revealed far too many inconsistencies. While the model number on the phone did show the SM-G906 belonging to the Samsung Galaxy S5 Prime, the screen's resolution is only 1080 x 1920. In addition, the 480ppi reading would indicate a sub 5 inch screen. And the chip inside is the Snapdragon 800. Conclusion? This is not the Samsung Galaxy S5 Prime, nor is it the Samsung Galaxy S5 Active. Well according to the video the sides are supposed to be aluminium as well. How about we all stop speculating both and call it Galaxy S10 Practive??? Indeed. I can't believe phonearena fell into this stupid deceiving video, a little bit of logic and you ll immediately notice that it is nothing but a $6.99 aluminum battery door for the S5. I tried one of those when I had the Note 3, looked great, felt great, and not easy to scratch, does affect the network signal a littleee bit, but my only issue with it was the GPS. It locks it down and I am so reliant on Sygic and google maps, so it was a no for me on my S5. What if the "Prime" is actually a S5 with this cover? Like Moto did with the G Forte? Hopefully this is close to the final design of the Galaxy S5 "Prime". I might give in and get this instead of waiting for the Note 4. I am a current iPhone user looking to jump ship to the S5 or Note 4 or one of their variants. If you've been waiting for worse cell reception and more radiation in your head, one of these aluminum covers should do the trick. I am waiting for the Note 4. Might even see a SD810 in it (fingers crossed). That's not the real deal. This guy is a fraud! You can't be serious. I'm surprised this article was written. 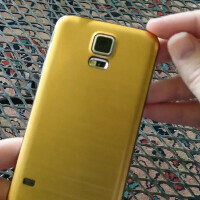 It's an S5 with an aftermarket back cover. Amateur hour, Phone Arena!!! Hideos and it's 1080p and Snapdragon 800 so active not prime. Aftermarket back cover? this is silly. If it was a new variant, he could have gone into settings and about ! Ehh ? haha that is the same s5 but the cover of the back is maybe aluminum and thick,.. lg G3 will knock this out! Get ready for "Prime Ugliness". At least it's still better than the S5's original design.